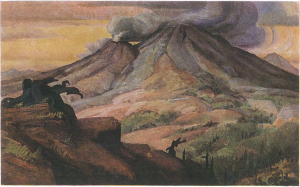 Throughout his career as an artist, museum director, consultant, and exhibit designer, Eugene Kingman was invited to work on a number of commissions. Featured below are some of his most notable commissioned accomplishments and contributions. EUGENE KINGMAN / NEW YORK TIMES MURAL – RECENT EXCITING NEWS! A special mural which Eugene Kingman painted in 1948 and was displayed in the New York Times lobby for a number of years, has been donated and shipped to the Joslyn Castle Trust in Omaha Nebraska for restoration. 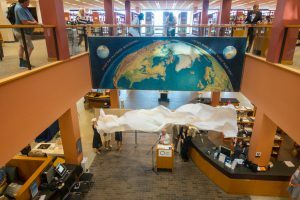 On June 16, 2016 the public was invited to attend a special Unveiling Celebration of this mural at the Omaha Public Library. Commissioned by The New York Times Publisher, Arthur Hayes Sulzberger in 1946, this mural was painted by Eugene Kingman in Omaha, while he was Director of the Joslyn Art Museum. In 1948 the mural was displayed in the main lobby of the NY Times Building for over 40 years, and remained there until the late 1980’s, when it was taken down during remodeling. In 2013 Maureen McCann Waldron formed a committee of Omaha art lovers and began working with the The New York Times and Kingman’s two daughters, Elizabeth Anne Kingman and Mixie Kingman Eddy, to return the mural to Omaha. In 2014 the Times donated the mural at the Joslyn Castle Trust to be restored, and displayed in its new permanent home, the Omaha Public Library in June 2016. For more background information, read Joslyn Castle’s Brochure, and a delightful New York Times article, written by David Dunlap right during the mural event. 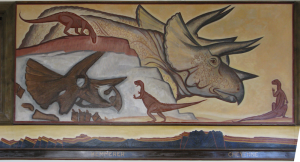 Also, a front page article in the Omaha World Herald describes this mural, and an earlier World Herald article announced the painting’s original installation. Additional photos of this mural and all the folks involved with its restoration are available here. The Kingman NYT mural was dedicated at the Dale Clark Library during a presentation by Maureen McCann Waldron,. The Kingman daughters (Elizabeth Anne Kingman and Mixie Kingman Eddy), and grandson, Quinlan Kingman Eddy were present. 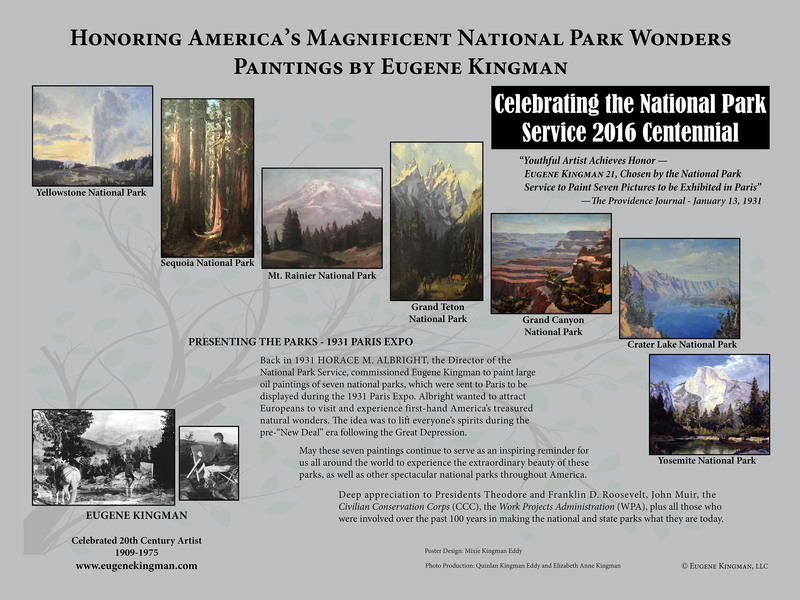 Eugene Kingman’s seven National Park paintings for the 1931 Paris Expo were displayed in a poster presentation during this special Symposium on June 20-25, 2016 in Santa Fe, New Mexico. This poster, designed by Eugene Kingman’s eldest daughter, Mixie Kingman Eddy, features paintings of popular national parks: (Yellowstone, Grand Teton, Grand Canyon, Sequoia, Mt. Rainier, Crater Lake, and Yosemite). 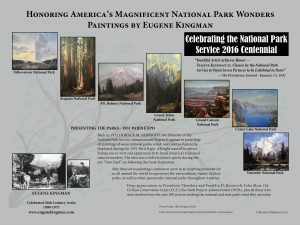 Back in 1931 HORACE M. ALBRIGHT, the Director of the National Park Service, commissioned Eugene Kingman to paint large oil paintings of seven popular national parks, which were sent to Paris to be displayed during the 1931 Paris Expo. Albright wanted to attract Europeans to visit and experience first-hand America’s treasured natural wonders. The idea was to lift everyone’s spirits during the pre-“New Deal” era following the Great Depression. 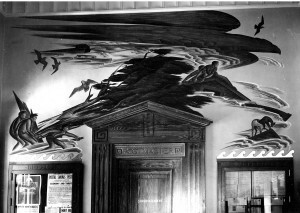 Eugene Kingman also won a major commission sponsored by the United States Treasury Art Project to create murals at three U.S. Post Offices. This was part of the Nation’s New Deal Artists Program to encourage promising talent to create art in public buildings and other community venues. More background describing these murals is here. Egg tempera on gessoed canvas. 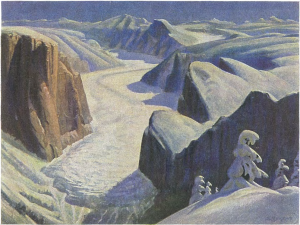 In 1936 Eugene Kingman was invited to use his combined scientific and artistic background to illustrate a geographic article by Wallace W. Atwood, who commissioned him to paint depictions of how Yosemite and Crater Lake National Parks evolved and might have appeared over millions of years. 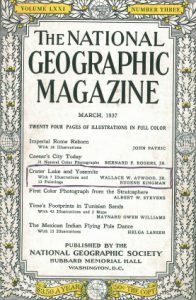 Read this fascinating article and view 13 of Eugene Kingman’s oil paintings in this 1937 issue of National Geographic Magazine featuring both National Parks. Yosemite National Park and Crater Lake National Park as they might have appeared centuries ago.